Over a decade ago, when I lived in a disreputable tenement on Union Street, I frequently went upstairs to visit my friend John Meline and his collection of esoteric LPs. One of those discs was music by someone I’d never heard of, Harrison Birtwistle. 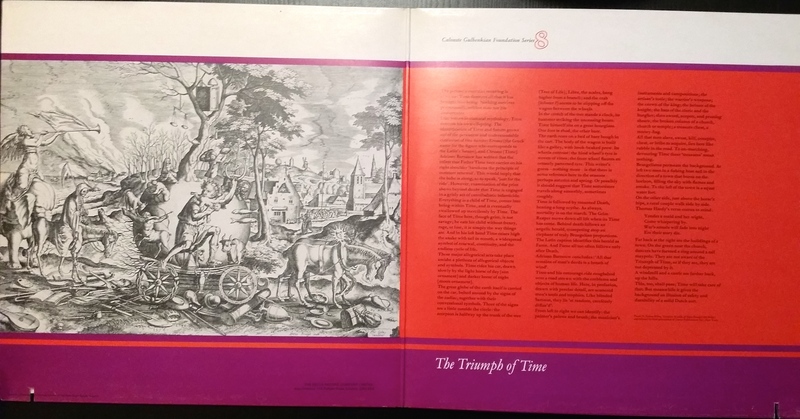 I might have passed over the album but for the intriguing gatefold packaging which included a reproduction of The Triumph of Time by the sixteenth-century Flemish artist Pieter Bruegel the Elder. After one listen I was hooked. This 1975 Argo LP was very important for Birtwistle’s career. 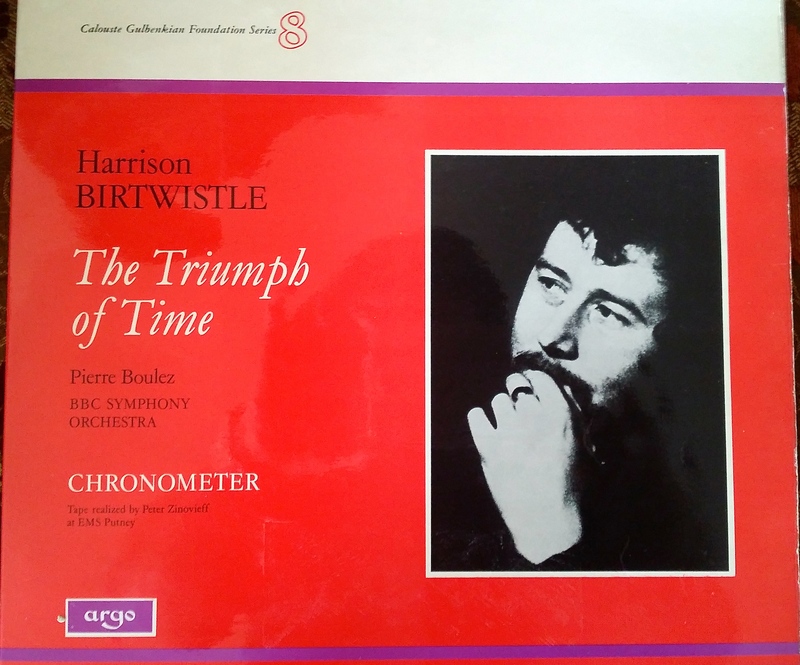 There’s quite a bit about The Triumph of Time in the book-length surveys Harrison Birtwistle, by Michael Hall, and Harrison Birtwistle: Man, Mind, Music, by Jonathan Cross. However, the most thorough technical exploration is in Martin Kier Glover’s marvelous essay “The Drama of Harrison Birtwistle’s The Triumph of Time,” available for rental or purchase from Cambridge University Press. Much of the commentary on The Triumph of Time (including that of the composer himself) deals cautiously with the programmatic nature of the work. 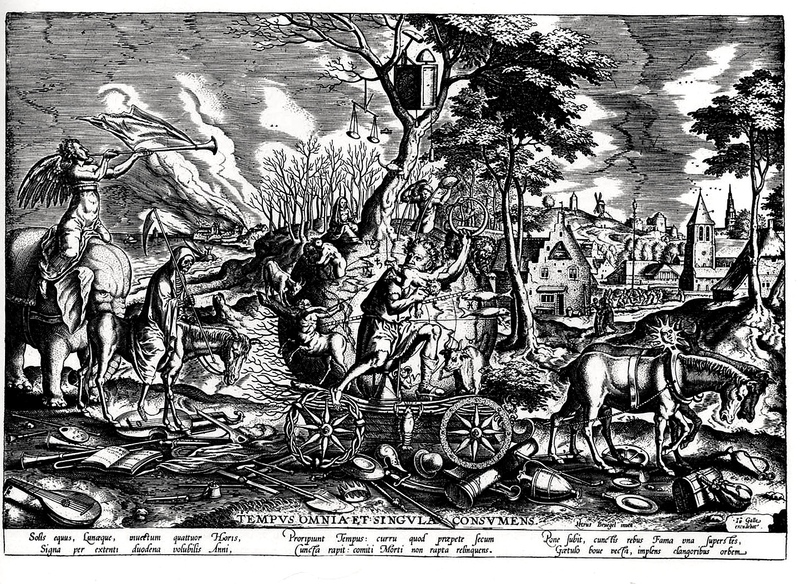 However, taking the Bruegel at face value is logical enough; indeed, the theatrical nature of the music is part of its charisma. For make no mistake, this enormous adagio is a soundtrack to death and destruction. Fantastical and gruesome, the orchestra grinds along in solemn procession, sometimes barely moving, other times battered by icy winds. Michael Hall’s book explains that Birtwistle’s atonal language has an unusual base: monody and organum, simple ancient chants harmonized in fourths and fifths. Birtwistle takes that basic material, pulverizes it, and throws it into new constellations. This chant-like aspect of his material is seldom obvious, yet it must be why Birtwistle’s melodies and harmonies have such a distinctive sound. The atonality of The Triumph of Time is granitic, almost barren, the twelve tones always present yet strangely empty. Sometimes modernist music scans as one long blur of discontinuity, but The Triumph of Time constantly offers the listener clear reference points. A few solo instruments have key roles: the work lurches into view with clockwork harp, a soprano saxophone periodically delivers a chilling descant, the cor anglais has what amounts to the big tune. Whatever is heard on top is usually working against a seething, unsettled mass. Special mention must be made of the percussion section, one of Birtwistle’s biggest assets for conjuring Lovecraftian unnamable fear and discord. The concert toms, wood blocks, and bass drum are a rubato carpet similar to classic free jazz. (Birtwistle even uses aleatoric notation for the final outrageous climax.) Once in a while, though, all the percussionists take up mallet instruments to chime away in frozen angst. Orchestral music reproduces rather poorly, especially modernist orchestral music. The spatial relationships that can be enjoyed in a concert hall are often essential to understanding the argument. There’s no doubt that I won’t be able to really appreciate the full impact of The Triumph of Time until I experience it live. A measure of how hard it is to balance the band in the studio is suggested by the 1993 recording conducted by Elgar Howarth: in two places the gain drops dramatically and artificially, perhaps because the engineer is trying to avoid distortion. It’s quite distracting, so much so that the 1975 version (only recently available on CD) conducted by Pierre Boulez is preferable. Still, musically the Howarth is excellent—you can tell the musicians have heard it before and really know how it goes—and at any rate it is really nice to have two versions to compare. Most big modernist orchestral works are lucky to have one commonly available rendition, let alone two. Tom Service: “Happy Birthday Sir Harrison Birtwistle!” at the Guardian blog. Ivan Hewitt: “Birthday Tributes” in the Telegraph.